Were camels present in the Indus Civilization or not? 45. Were camels present in the Indus Civilization or not? 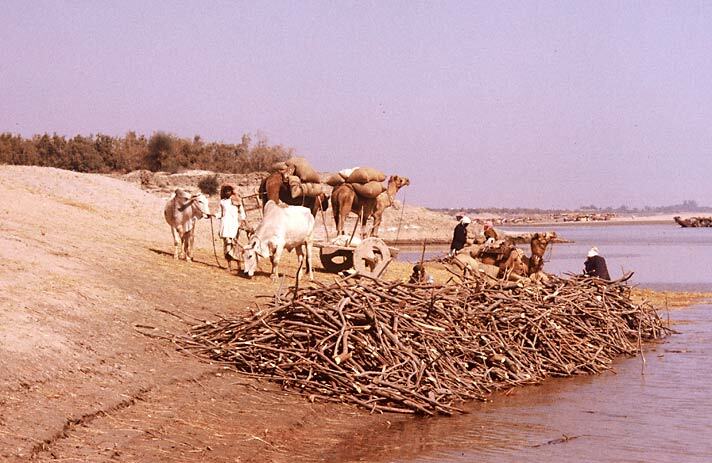 Camels carrying grain wait for the ferry boat and an ox cart waits for passengers from across the Indus River near Mohenjo-daro. Camel bones are known from late levels of a few sites, particularly in Gujarat, and have mainly been identified as the single-humped Arabian camel (dromedary). Current evidence suggests this was not domesticated until much later, but the people of Oman, with whom the Harappans traded, exploited wild dromedaries, so the Harappans may have obtained camel bones, meat or even captive wild camels from there. Bactrian camels had been domesticated earlier and were in common use in eastern Iran and Afghanistan in Harappan times, for meat, fur and as pack and draught animals. They would have been known to the Harappans at Shortugai, where a crude camel figurine was found, and may have accompanied traders visiting the Indus region. Another figurine was found at Kalibangan. However, there is no evidence that Bactrian camels were kept by people in the Indus region until after the Indus civilization.